Please be as detailed as possible so that we may provide you with an accurate estimate. If this is an emergency, please call our 24/7 hotline at (215) 443-0650. Preventative maintenance pumping of your septic tank is necessary to eliminate solids from being carried out of the septic tank into the soil absorption system (drainfield). The frequency with which you pump your septic tank depends upon: 1) the size of the septic tank, 2) the number of people occupying the house, and 3) whether or not you have a garbage disposal. Typically, every one to three years is a normal pump out frequency. The best thing to do is have the septic tank inspected annually and pump when it becomes 20 – 30 percent full of sludge and scum. This will minimize solids carrying over into the soil absorption area. Is there anything that I can add to my system to help it along? Bacteria present in the waste stream is all that is necessary to breakdown the wastes in the septic tank. Recent research proves that there is little, if any, benefit derived from septic tank additives. Use of these products does not eliminate the need for maintenance pumping. Is it true that if I have a septic system I cannot have a garbage disposal? It is true that a garbage disposal impacts your septic system by adding both solids and water to the system. Water used to wash the garbage down the drain impacts the soil absorption system (drainfield), while the garbage tends to accumulate in the septic tank consuming sludge storage capacity. But prudent use of the garbage disposal (don’t put down bulky items that are just as easily put into the trash can or compost pile) and more frequent pumping of the septic tank will allow you to use this modern convenience. Are water softeners harmful to a septic system? Properly operating water softeners should not be harmful to a septic system. It should use the required amount of salt (sodium chloride) for recharging and it should not recharge more frequently than needed to supply the conditioned water used by the family. It has been proven that the salt is not toxic to the microorganisms in the septic tank (in fact it is slightly helpful). Sodium can be detrimental to the soil absorption system. It is important that the water softener recharge water discharge into the septic system. The calcium and magnesium removed by the water softener need to be placed back into the waste stream to counter any effect of the sodium. Be careful to check the water softener discharge line for leaks. Encrusted valves can leak large amounts of water in the septic system. Is there anything I should not put into the septic system? Remember that the septic tank is not a trash can. Products such as paper towels, sanitary napkins, cigarette butts, etc. are best not put into the septic tank. Things that will not decompose should not be flushed down the toilet. Similarly, greases, fats, coffee grounds, etc. should not go down the kitchen sink. Do you recommend a certain kind of bathroom tissue? No. All bathroom tissues will break down in the septic tank. Are some cleaning products better for the septic system? While products such as bleach, toilet bowl cleaners and other disinfectants could, if used excessively, be detrimental to the microorganisms in the septic tank, normal usage of these products does not impact the microorganisms greatly. There are products available that are not as harsh, please read the label on products you intend to buy. I have no idea where my septic system is located. Are you going to dig up my whole lawn to find it? If the manhole access to the septic tank is not already on the surface of the ground, it will be necessary for some digging to take place for us to access your septic tank. Fortunately modern technology has arrived in the septic system industry eliminating unnecessary digging. Radio frequency transmitters, either flushed down the toilet or attached to drain cables, in most cases, lead us quickly and efficiently to your septic tank. We have lived here for thirty years, this is the first problem I have ever had. How do I know this is not just a one-time thing? Chances are that if you have gone thirty years without removing accumulated sludge in you septic system, many of those solids have already washed into the solid absorption system causing irrevocable clogging of the soil pores. Remember, this did not just happen, it took thirty years! Further investigation will tell if this is an easily correctable problem or a complete malfunction of the septic system. If my alarm goes off should I stop using water immediately? Do I need to wait until the service man repairs the problem before I resume water use? There is some capacity built into the system. 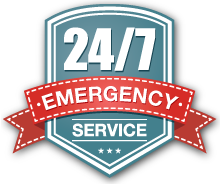 When the alarm goes off, you should contact us immediately, we will respond quickly to your call. You should minimize your usage of water (don’t run the clothes washing machine), but you do not have to stop completely. If the power goes out in a storm won’t my pump be affected? Will it back into my house if I use the water? Short of being struck by lightning, the storm should not affect your pump. The pump does not run continuously, actually, the pump works for five to ten minutes three or four times a day. Chances are electricity will be restored before the pump needs to pump again. There is capacity built into the system should the electricity be out for an extended period. Minimize your water usage and call us if you are still out of electricity in 24 hours. Why can’t we just repair my old cesspool or dig another one? The old one worked for thirty years without needing any attention. Environmental regulations preclude the use of cesspools. It is possible that cesspools (deep holes in the ground) could pollute the ground water. Today’s septic systems must dissipate water used in the house while protecting the environment. They do this by using the shallower soils as a filter media. 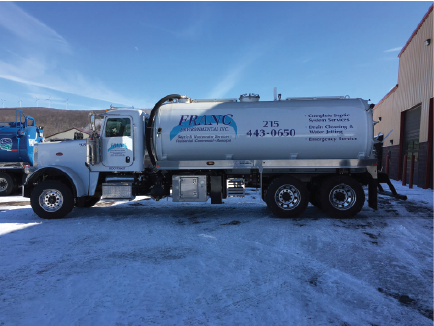 Any repair to an on-site sewage disposal system is regulated and needs to be permitted by the Pennsylvania Department of Environmental Protection and usually the County Health Department. If my problem is just an inconvenience to me, can the Health Department make me fix it before I am ready? Yes. If the Health Department feels your problem is a public health concern, they can require you to repair the system. How do I know that after spending all this money on a new septic system that sewers are not going to be offered to me next year? You should check with your Township engineer before beginning the septic system alteration permitting process. The Township will have a ten year plan defining a proposed schedule for new sewer connections. If you are not on the ten year plan, you probably will have a long wait for sewers. How can I avoid putting in an ugly sand mound like the one my neighbor was forced to install? Your neighbor’s sand mound was required because the soils on his property were too shallow to allow a conventional in-the-ground soil absorption system while meeting the standards for an elevated sand mound. Your site may or may not have similar soils. Today, however, there may be alternatives to the sand mound for your property (such as drip irrigation or at grade systems). How long does it take to get my permit once I have signed the papers? Typically, the time to conduct the soils testing, design the system, receive approval and permit from the County Health Department is six to eight weeks. How long does construction take once you begin? This depends on the system design. Most systems are completed in three to five days. Be assured that you will not be without the use of your facilities throughout any of the construction period. If my septic system is placed upslope of my well, won’t it run down hill and contaminate my water supply? While water dissipated from the soil absorption system moves laterally (sideways) and vertically (downward), the fact is that the soil is such a good filter the water is renovated (cleaned up) in just a few feet. The required 100 foot buffer distance from the well is very conservative to insure no contamination could ever take place. Who determines what I get for a new septic system? I don’t want to spend a lot of money if I don’t have to! The regulations and the soils on your property pretty much tell what type of septic system you will need. The regulations require certain minimums such as septic tank size and area of the soil absorption system. Generally, the minimum requirements will be sufficient for your usage. You can, however, make upgrades such as increasing the septic tank capacity or area of the soil absorption system, installing septic tank effluent filters, or pressure dosing what could be a conventional gravity fed system. Why should I consider letting you act as my consultant? Can’t I do any of this myself? While we will do nothing for you that you could not do yourself, the training and experience that we possess are invaluable. The regulations and soils on your site will be interpreted by the County Health Department. Without an experienced consultant, you must rely on the County Health Department to tell you what to do. Many times a consultant can make the difference between an affordable reasonable solution or an expensive bureaucratic solution to a problem. Can’t you just come in on a Saturday, dig a big hole and fill it full of stone? What could happen? Who would know? As your consultant we can tell you that it is illegal to make such changes to your septic system without the proper permitting in place. Without the soils evaluation that the permit application requires, no one knows what the correct solution to the problem should be. Chances are you may do this and not get caught, but if you do, the fines are expensive. Worse than a fine, you may have trouble again the first time it rains! In the long run, it pays to do the job right the first time. Why does my septic system require a pump? Isn’t it more costly and subject to breaking down? Site conditions and/or DEP regulations are the reasons your system requires a pump. If the area for the soil absorption system is upgrade of the septic tank, you need a pump to lift the effluent from the septic tank to the soil absorption system. If the soil absorption system is an elevated sand mound or trenches, or if the percolation rate is slower than 60 minutes per inch, the regulations require the system to be pressure dosed. This is usually done with a pump. And, yes the installation of a pump adds cost to the septic system and the pump will break down some day (life expectancy of a pump is between 8 and 10 years). The good news is that pressure dosing the soil absorption system adds many years to the life of the septic system. This increase in system longevity is well worth the cost of a pump replacement. Won’t the pump require a lot of electricity that will cause my electric bill to go up sharply? Actually, the pump works very little over the course of a day. Normal pumping rates are about 20 gallons per minute, the average household uses 400 gallons per day of water, therefore, the pump will work about 20 minutes per day. These pumps are usually ⅓ to ½ horsepower.